MWB Rev. John D. Vincil, orphaned as a child, was passionate about the creation of the Masonic Home of Missouri, served as Grand Secretary, and served on the original Board of Directors. A true leader, MWB Vincil also served two terms as Grand Master of Missouri, assisted with the formation of the Order of the Eastern Star in Missouri, served as the first Worthy Grand Patron, and served as the first Most Worthy Grand Patron when the General Grand Chapter was organized. What is The Vincil Society? The Vincil Society recognizes the financial support of lodges, chapters and other organizations to assist individuals in need statewide. The support of The Vincil Society members is essential for the Masonic Home to help those in need. In Fiscal Year 2018, Vincil Society members contributed nearly $112,000 to assist individuals in need statewide. The Vincil Society recognizes cumulative giving to the Masonic Home since January 1, 2014, and eligibility begins at $500 in cumulative gifts. As you continue to give, your organization will move up through the giving levels. Once your organization’s cumulative giving has reached a qualifying amount, we will notify you of your membership eligibility. Gifts that do not qualify: Creating-A-Partnership (CAP) and Partnering to Honor (PTH) donations matched by the Masonic Home, per capita fees, and gifts to other Masonic charities. Levels are based on an organization‘s cumulative qualifying donations made to the Masonic Home of Missouri since January 1, 2014. New Vincil Society members and those who have achieved a new level during the year will be formally recognized with a certificate or plaque for display at their organization and permanent recognition on The Vincil Society Donor Wall, located at the Masonic Complex in Columbia. Gifts received by August 31 each year will be included for recognition purposes within that year. How Can My Organization Join The Vincil Society? We invite your Lodge, Chapter, or organization, to join The Vincil Society. To join, contact our Annual Giving Officer or at 800-434-9804. We are a struggling Lodge, but that doesn’t mean you can’t help others. 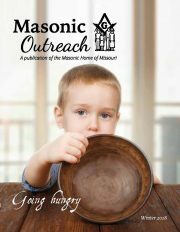 Make a dedicated effort to support the Masonic Home by having your members give $3.65. You can’t even eat at McDonald’s for that, but if everyone gave that amount, think about the people that you would be helping. I really want to encourage other Lodges to become involved by either donating through tribute gifts, Penny-A-Day, golf tournament sponsorship, or participating in the CAP Program.